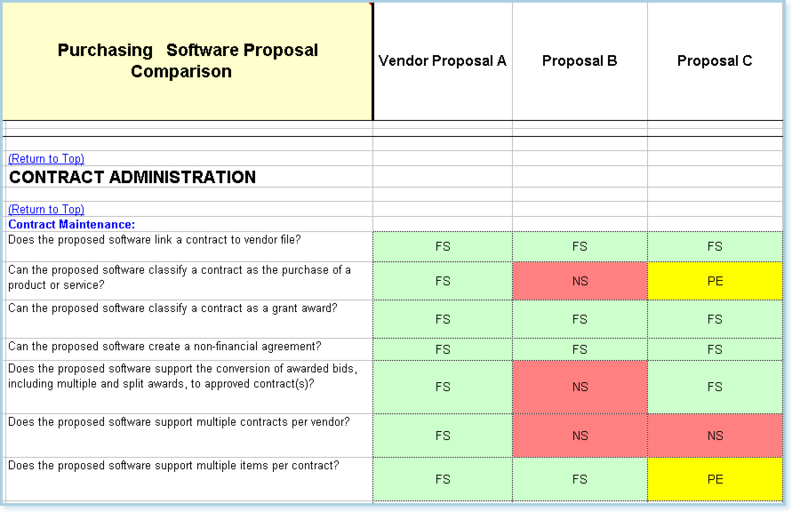 Many people feel the most difficult step in selecting software is that of evaluating and comparing vendor RFP responses to the RFP. 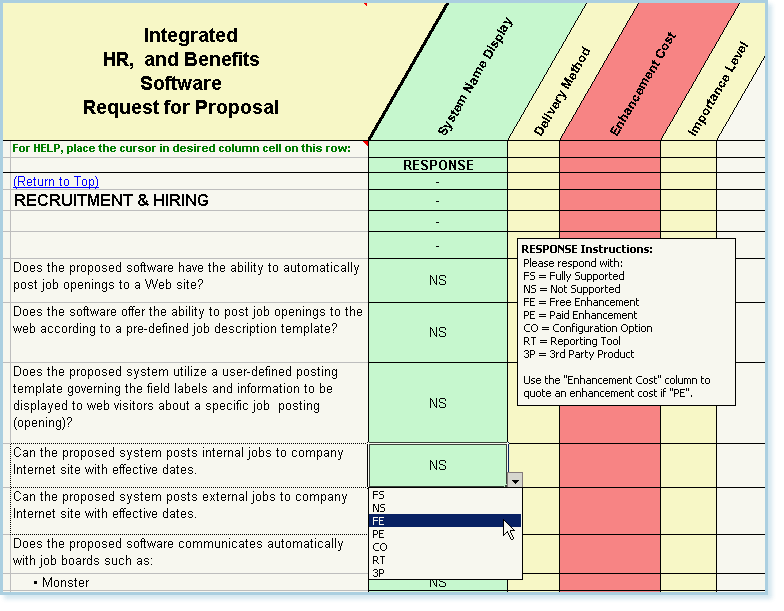 Due to this need, all Infotivity RFP Templates come with a Software Selection Toolkit containing ALL of the vendor response evaluation, comparison, and selection tools shown below on this page. Also available separately, see details at bottom. The Software Selection Toolkit™ simplifies and streamlines complex vendor proposal evaluation tasks with advanced tools and scorecards that use your company's strategic priorities to provide much more accurate decision making data than traditional side-by-side comparisons. "FULL VENDOR RFP RESPONSE INPUT VALIDATION ensures all vendor responses (proposals) will be consistent by forcing vendors to choose from the same list of possible responses when responding to the RFP. This SAVES SIGNIFICANT TIME by eliminating response discrepancies and the need to manually review and re-categorize responses. This makes vendor response evaluation and comparison at the detail level very EASY, FAST, and most importantly, ACCURATE. View a typical vendor input facility here. 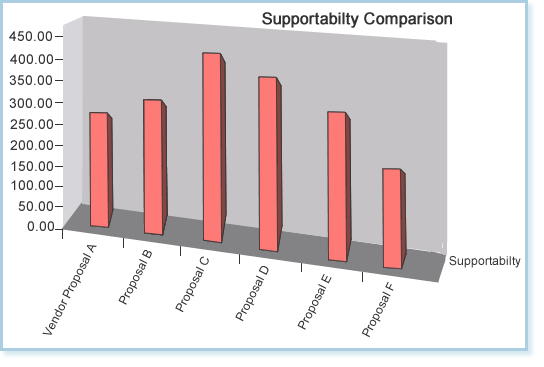 "APPLES-to-APPLES" SYSTEM COMPARISON of vendor RFP responses (proposals) is assured by extensive use of quantitative software RFP questions and full vendor response validation. Compare proposed system software features side-by-side faster and more accurately with the fully automated Comparison Heat Map included with all RFPs at no extra charge. View a typical comparison here. CUSTOMIZABLE WEIGHTED SCORES calculated at the individual software feature level provide the utmost in flexibility for RFP response scoring sub-module capabilities and overall vendor RFP response evaluation. View Weighted Grade Score calculation details here. "RESPONSE EVALUATION RATIOS illustrates in detail and in a side-by-side comparison the strengths and weaknesses of each vendor proposal from a practical perspective. Learn HOW each vendor is planning on meeting your needs, and how reliable that approach really is. View a typical evaluation ratios here. "SIDE-BY-SIDE COMPARISON OF RESPONSE RATIOS illustrates in detail and in a side-by-side comparison the strengths and weaknesses of each vendor proposal from a practical perspective. Learn HOW each vendor is planning on meeting your needs, and how reliable that approach really is. View a typical evaluation ratios here. "In-Depth Financial Analysis Ratios provide valuable insight into how proposed software will impact your organization immediately and over the long term. View and compare side=by-side key financial ratios such as Payback Period, Present Value (PV), Net Present Value (NPV), Internal Rate of Return (IRR), and others. View financial analysis ratios here. AUTOMATED WEIGHTED GRADE POINT SCORING is a quantitative measure of how well a proposed software system matches up to your business priorities. This graph compares the overall total scores for each proposed system. This Score is based on all vendor responses except Pricing and Vendor Background. View sample 3-D Bar Chart comparison here. 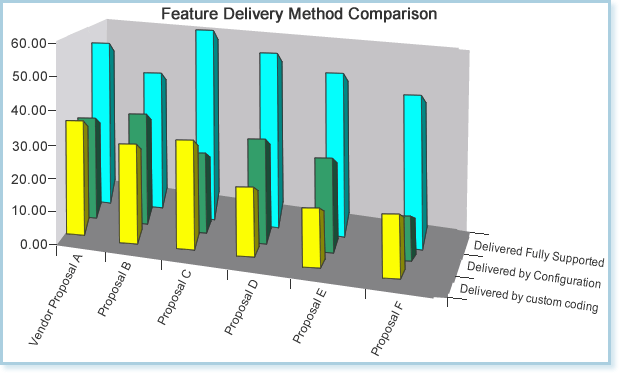 Feature Delivery Methods This graph compares HOW each vendor is planning to deliver the proposed system. The bars show how much of each competing system is going to be delivered Fully Supported "out-of-the-box", how much will be delivered using the Report Writer, a Configuration option or 3rd Party product, and how much is dependant on Custom Programming & Scripting. The scores used in this comparison are based on responses to software system questions only, i.e., no vendor, pricing, or support responses are utilized. View sample 3-D Bar Chart comparison here. Supportability Index A proposed system could look very good on paper, but once implementation begins the reality could be very different. The ease with which a system can be implemented and maintained over it's expected life is controlled in large part by the amount of custom programming and scripting required to build & maintain the system. 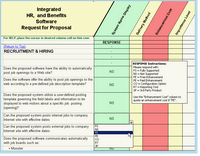 The Supportability Index is based on responses to Software System Features only. This graph compares the potential support effort inherent in each proposed system. View sample 3-D Bar Chart comparison here. 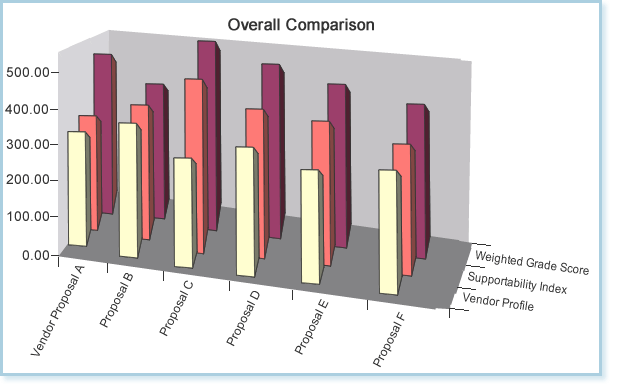 Overall Comparison This graph compares the total Weighted Score of each proposed system along with its Supportability Index and associated Vendor Profile. Use this when assessing the RISK of a proposed system and whether or not the system can indeed be implemented by the proposing vendor successfully. View sample 3-D Bar Chart comparison here. 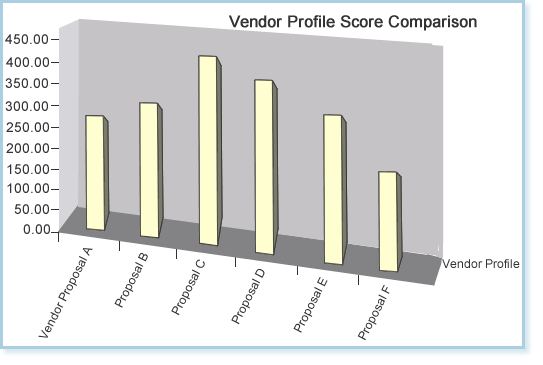 Vendor Profile Scores This graph compares a score measuring the background, expertise, capabilities, and other data collected in the Vendor Global Issues section of the RFP. The Vendor Profile Score provides a way of assessing the Capabilities PROFILE of a proposing vendor. View sample 3-D Bar Chart comparison here. EASILY CUSTOMIZED to meet your unique system needs, using basic Excel techniques. Ensures all vendor RFP responses will use the same response values, eliminating the telephone tag and time wasted trying to manually review each vendor response separately, clarify them with vendors, then re-classify vendor responses, all in an effort to obtain a clear response comparison. This making vendor response comparison and evaluation fast, efficient, and very accurate. Use an extensive set of ratio calculations to compare vendor proposals quickly and efficiently. Use an extensive set of CUSTOMIZABLE Weighted Grade Scoring calculations to evaluate the suitability of vendor proposals to your specific prioritized needs quickly and efficiently. This scorecard uses an extensive set of ratio calculations to compare vendor proposals quickly and efficiently. 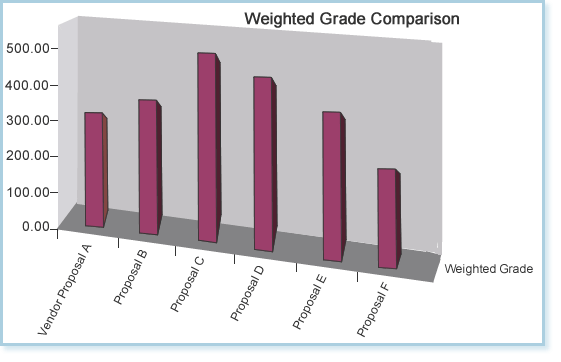 Compares the Weighted Grade Point Score calculated for each proposed system. 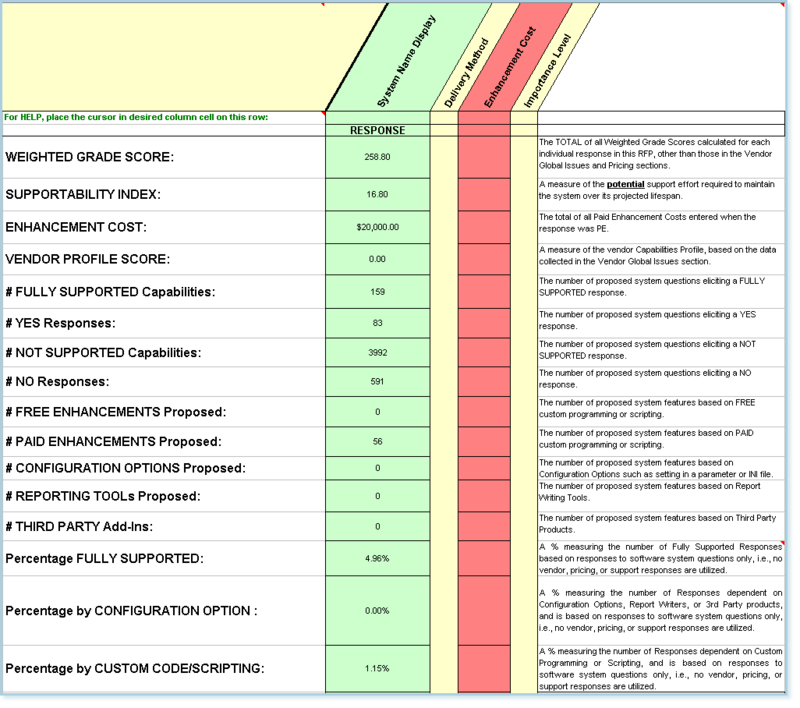 This is calculated as follows: The vendor response to each RFP question is assigned an unweighted "raw" score. This raw score is then multiplied by the weight factor you entered previously (default = 1) for that RFP question to calculate the weighted score for each response. All of these individual scores are then totaled for use in this comparison. This score is essentially a measure of how well a software system fits your business and software needs, prioritized by the weight (importance level) you assigned to each question in the RFP. In essence, this score measures the SUITABILITY of each proposed software system to your overall requirements. . NOTE this score measures just software functionality, and does not include any measure of vendor background, expertise, support, or programming ability. An analysis of how each vendor is proposing to deliver the software feature/function contained in their proposal. The graph below shows the percentage that is Fully Supported "out-of-the-box", the percentage to be done via Report Writer, a Configuration Parameter, or Third-Party add-in, versus the percentage to be done via Custom Coding (Scripting / Programming). This information is very useful in terms of identifying RISK, since a Fully Supported (and tested) feature presents far less risk than that same feature done as a "custom programming" task. Also, see the Supportability Index, which sums up these detail risk factors. The Supportability Index is a forecast of how much software support and maintenance may be required to keep each proposed system running at full potential over it's lifetime. This score is determined by how much custom coding is required to implement the proposed software, and which business processes depend on the customized software. The purpose of this graph is to compare the Weighted Grade (Suitability) Score, the Supportability Index, and the Vendor Profile of each vendor side-by-side. It is critical to measure the amount of custom coding found in proposed systems that also have a high Weighted Score, and then measure the Vendor Profile. Systems with higher amounts of custom coding and/or scripting pose a higher degree of difficulty, and require more expertise and capabilities from a vendor. Does the proposing vendor have the required expertise? The backgrounds, expertise, capabilities, and certifications of each vendor is obtained in the Vendor Global Issues section of the RFP. The vendor responses to this section are totaled separately from the software functionality topics, and this data is used to calculate the "Vendor Profile Score". The higher the score, the more CAPABILITIES a vendor is probably going to be. 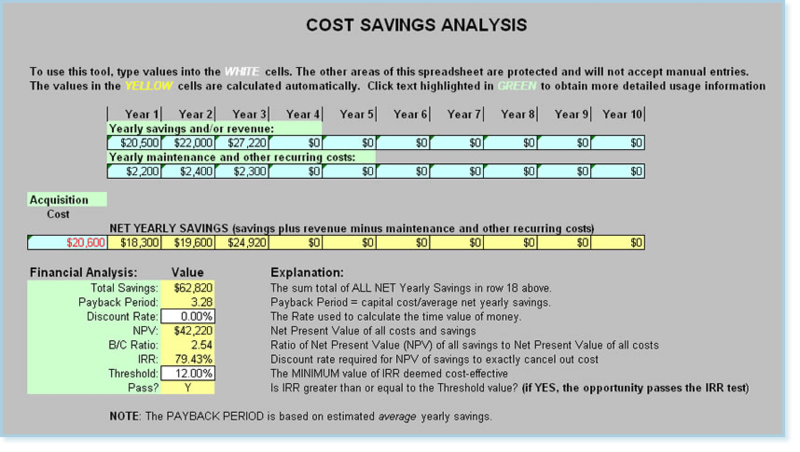 COST SAVINGS ANALYSIS - Calculates and illustrates Yearly Savings, Payback Period, Return on Imvestment (ROI), Internal Rate of Return (IRR), and other software project decision making ratios. This comparison heat map automatically change vendor response cell background color to GREEN, YELLOW, or RED, to reflect how favorable each response is to your company needs! Compared to the tedious task of reviewing hundreds of mono-color Yes/No answers, these colored responses allow problem areas to be spotted more easily, and risk assessment is made much more accurate. All required system response comparison heat map are included and ready-to-use! Quickly and easily compare software system proposals side-by-side, feature by feature, in detailed comparisons you control! Keep your project on-schedule and under-budget. 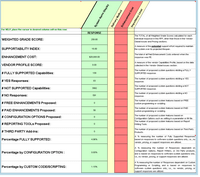 This Vendor Response Evaluation Scorecard Toolkit is INCLUDED with all RFPs on the RFP Template List! It is also available separately for $169.00 - just click Add to Cart! 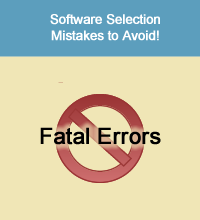 Choose software efficiently using these quantitative software system selection tools. Each enables you to assess user requirements, quickly determine system requirements, distribute quantitative RFPs, compare & evaluate vendor software proposals, and select the best software for your organization's needs.